Take that, Office for iPad! Microsoft recently upped the ante for mobile productivity with the debut of Office for iPad, and today Google is responding with a pair of its own apps for editing and creating documents or spreadsheets from virtually anywhere. The Google Official Blog announced the release of Google Docs and Google Sheets, a pair of free standalone mobile apps for Android and iOS which allow smartphone and tablet users to stay productive while on the go. Now available from Google Play (Docs, Sheets) or the App Store (Docs, Sheets), the free Sheets and Docs apps allow owners of mobile devices to find, edit and create files stored on Google Drive. Best of all, Google has baked offline support into each app, allowing not only viewing but also creation or editing of documents and spreadsheets even when an internet connection isn't available. Over the next few days, Google will prompt Drive users to download the new Docs and Sheets apps whenever they create or edit files, although the Drive app itself can still be used to view and organize documents and spreadsheets. The standalone Docs and Sheets apps also make it easy to find recently edited files, presenting them again at launch to cut down on the amount of time needed to scroll and search for them. Google also hasn't forgotten about its own cloud-based presentation software, promising that a standalone app for Slides will be "coming soon," without elaborating on how soon it might arrive. The launch of dedicated Docs, Sheets and Slides apps will certainly be viewed as a shot across Microsoft's bow, given the Windows maker's recent Office for iPad apps require a paid Office 365 subscription to do anything more than view existing files. 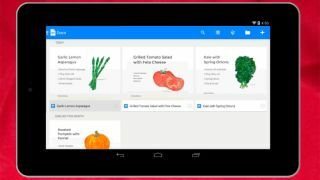 Find out the best tablet to use with your new Google Docs and Sheets apps!